Adapted from the Multigrain Bread recipe in Cook’s Illustrated, March-April 2006 and from Roasted Three-Seed Bread in Brother Juniper’s Bread Book (1991). A very satisfying bread. 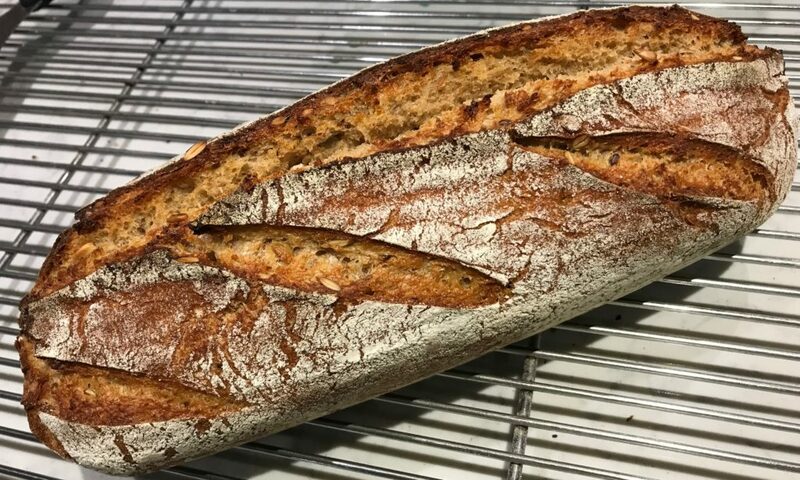 The first time I made the yeast version of this bread in 2006 on the Eastern Shore, our local whole foods supplier Quail Cove was out of Bob’s Red Mill 7-grain hot cereal mix, so I used half 5-grain and half 10-grain Bob’s Red Mill hot cereal mixes. After trying the 7-grain mix another time, I went back to the combination of 5-grain and 10-grain. It turns out that the 5-grain mix contains 5 of the same grains as in the 10-grain mix, but they are processed differently. I’m still going to call it 15-Grain Bread. Roast seeds in a skillet over a medium flame for a few minutes until they start to pop. Add sourdough starter, honey, salt, water, and flours to the mixer and stir to combine. Add more flour until dough cleans the sides of the mixer. Turn off mixer and let dough rest for 20 minutes. Knead on medium-low speed for 3-4 minutes. Add seeds and mix until seeds are evenly dispersed, 1-2 minutes. Place dough on a floured counter and cover with plastic wrap. After the dough has rested 20-30 minutes begin four rounds of stretching and folding about 30 minutes apart. Cover between folds. Then allow the dough to continue its bulk fermentation another 2 to 7 hours, depending on temperature and starter strength. Look for puffy edges and approximate doubling. Preshape the dough and let it rest for 20-30 minutes. Shape dough into an oblong. Generously coat an oblong proofing basket with flour; put dough seam side down in basket and dust with more flour. Cover and proof in the refrigerator 10-16 hours, or at room temperature 2-3 hours, or in any number of other combinations and permutations. Preheat oven to 500°F 30 minutes before baking. Place an oblong clay baker into the oven to preheat. Using an instant-read thermometer, the internal temperature should be around 205-210°F. Remove the bread from the clay baker. Let the bread cool completely on a rack before slicing.